(CNS): Despite the anticipated challenges to their two candidates in Bodden Town, the United Democratic Party was meeting today to discuss their future government and the likely ministerial positions. 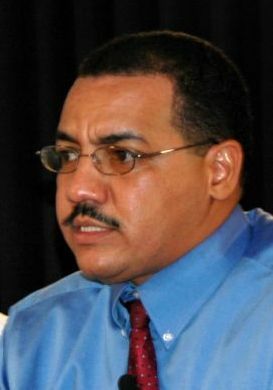 Rolston Anglin, the second elected member for West Bay and the man tipped to take over the Ministry of Education, said that the team would be discussing how the new UDP government will take shape today, but they were well aware that they needed to consider the implications of any challenges to the Bodden Town Candidates. How that work will be done will depend on who gets which ministries and whether in fact those ministries would be reorganised. Anglin noted that the situation in Bodden Town had to be considered, particularly as Mark Scotland could be a likely ministerial choice. “We understand the implications of the Bodden Town situation,” he said, adding that he had no doubt that the two candidates would retain their seats regardless of what happens, but the time factor had to be considered because of the work that needed to be done to get Cayman back on track. Discussing Osbourne Bodden’s comments last night that there would have to be a challenge to the two UDP candidates, Anglin said that while Bodden may have taken that position last night in the wake of defeat, he thought that logic might prevail. “I am not sure he would want to kill himself like that politically,” Anglin said, adding that he was confident that the two would be re-elected in any by-election and probably with an even greater margin. Both Scotland and Dwayne Seymour’s election remains contentious since neither of them met the criteria under the Constitution to be elected to the Legislative Assembly as they both failed to declare their businesscontracts with government before the deadline set out under Section 19. During the elections campaign the issue was declared by both Kearney Gomez, the Supervisor of Elections, and Attorney General Sam Bulgin as a matter for the court, as they said there was no mechanism for removal from the election beforehand. The challenge can come not just from losing candidates but also from any Bodden Town voter. The question as to whether a judge would simply rule that Osbourne Bodden and Charles Clifford would be duly elected or initiate a by-election in which the candidates may or may not be allowed to run all still remains open to question. The question is considerably more important with regards to Scotland, who was first elected member in the district and the one most likely to receive a ministry. CNS has made efforts to contact members of the People’s Progressive Movement for comment on the result, the potential challenge and any concerns they may have over the accusations of undue influence made in George Town during yesterday’s poll. Last night’s election result was almost a complete flip of the 2005 result for the PPM. The UDP returned nine of their own candidates and the one independent that was returned is regarded as ‘user- friendly’ for the UDP, but whether long time political stalwart Ezzard Miller will choose to join the party remains to be see. Theresa was a UDP in the making too, because UDP was planning on running three in BT. Just because she did not like what Big Mac said, she run out of the meeting and said she would run alone. Remember two bulls can’t live in the same pen. Not only did Big Mac made some deals with you know who, I know that you Rolston will not FORGET the deal he made with you. Rolston, remember Big Mac said "I will step down and make you Leader of Government Business"
Hold him to it Rolston, he said it and am going to see if he will be a man of his own words, step down now you said it. SO STEP DOWN!! There is a constitutional requirement—-that was not met–is it right or worng. Both issues are right. Public who voted for UDP are going to vote again for them so no problem for Mr.mark to be the Minister. I think there is a flaw in the constitution/procedures. Possibly the Election commission should have authority to declare the eligible candidates to contest rather after election to be challenged in courts. Does not make sense. "Public who voted for UDP are going to vote again for them so no problem for Mr.mark to be the Minister’. One cannot be a Minister until he has been validly elected to the Legislative Assembly. That is the problem. As for any by-election, it is by no means a foregone conclusion that that is what the court would order. It could just rule that those votes were thrown away so that the next candidates in line step up. I am so sick of hearing of the accidental oversight! It doesn’t make a difference if it was done accidentally or not! I know LIME, CUC and Water Authority all cut off their services whether I ACCIDENTALLY forget to pay may bill, purposely don’t pay my bill or just simply can’t afford to pay it. The consequence is the same! You see, there are policies, rules and regulations for all to follow. ALL – not just a few who want to follow the rules. If this was truly an oversight on both Mark & Dwaynes part- could their fellow party candidates not have advised them on the right thing to do? Isnt this what Mr. Bush is now advocating for? Transparency? I am sure this was not something he woke up on election day to strive for but must have been part of the basis of their campaign. Then after all this time- could his fellow UDP’ers not have advised both Marky and Dwayney to deal with this before getting to the point we are at now. Then someone calls in on the talkshow yesterday (big UDP supporter) claiming that any judge in their right mind would overturn this case/challenge because the fact that they did not claim govt contracts did not affect the outcome of the election. Well sir- you are wrong- this shows your ignorance and lack of fundamental education…because the fact is that the CONSTITUTION WAS broken!!! I am for neither party because in some way have been let down by both…however, this not a good start to the UDP. To think that this has already made news in the Caribbean region. Come one now Mark and Dwayne- speak out about this and come clean as your NEW LOGB is advocating transparency…be up front about it and do the right thing. Either way prayer must continue whether UDP or PPM supporter because I dont think we realise what we are in for… especially once this starts to break around the globe. We are here fighting to get on the white list with OECD and we cant even elect honest politicians into the House. Or is that an oxymoron…hmmm "honest politician"….yes I think it is. I voted PPM in BT and we lost this election. Now, for the good of this island let us simply allow the true winners, the people of BT to keep thier seats without challenge. The people will simply put Mark And JohnJohn back in, in fact, there will be a greater resounding YES vote now that UDP has won. No one wants to be on the side of the losing team who is not going anywhere but down. This time around I and many more will even vote for UDP Jah lives. I voted PPM all the way too because they were my team .This time around if we get a Byelection I would vote for Mark and Theresa and not Dwayne .As these two are far more EDUCATED and KNOWLEDGEABLE than Dwayne .And the UDP team would do well to have her EXPERIENCE on the team .I think Bodden Towners deserve a woman in the house .So wake up Bodden Town and VOTE for Theresa and Mark .And i hope and PRAY the real loosers J.W _S.C_G.M._V.F_C.C dont run they have seen they dont stand a chance . I honestly think that to be so negative is a crime. Considering that this was Justin Woods 1st time running and beingan independant candidate in a district with so many others running I think he did very good – you have to give credit where credit is due. It’s funny how quick you would jump the ship cuz it is just a few days after election and already you are willing to vote for other candidates other than the PPM (Chuckie and Ozzie can still run you know) By the way I vote in West Bay and I was for the independants. The comments for "I Honestly think to be" were in reply to "I voted PPM all the Way". "I voted PPM all the way too because they were my team .This time around if we get a Byelection I would vote for Mark and Theresa and not Dwayne". If that is true you are very silly. The other two PPM candidates are also educated. No matter the outcome the UDP will be the govt. However what we need to ensure is that there is a robust opposition to keep them accountable. Theresa is really UDP so no help there. Glad Ellio did not get a ministerial position – not like he’s qualified for one. Mark cannot get road works as there’s an obvious conflict of interest. Hence why declaring government contracts is so important. Also, I’m shocked he has HSA ….. really shocked to be honest. Do tell me – how will Mark run his 2 business and the country’s affairs? When will he resign from those? Mark and Dwayne should be challenged. As a long-term resident (without a vote but not without a voice), I am saddened at the ever-increasing arrogance of the UDP members and supporters. "Anglin said that while Bodden may have taken that position last night in the wake of defeat, he thought that logic might prevail.“I am not sure he would want to kill himself like that politically,” Anglin said, adding that he was confident that the two would be re-elected in any by-election andprobably with an even greater margin"
This is NOT a case of prevailing logic. THE most important document (and foundation!) of the land, the Constitution, was clearly and self-admittedly breached by Messrs. Scotland and Seymour. They cannot and (if men of honesty, integrity and principles) should not think they are above such a body of fundamental principles and established precedents! If, as Rolston said, the UDP are confident of their re-election "probably with an even greater margin", then a possible by-election should not pose any threat or worry whatsoever to the candidates in question plus their acceptance and compliance with whatever the Court’s ruling will be will go – in some way – towards reassuring the public that the UDP are and, going forward, will indeed be, upholders of every and any law and fundamental principle. May God bless and guide Cayman’s legislators over the next four years. Well for sure Elio has to be in Exco. Mike was with Cayman Airways for years and years and years so we know just how useful he will be as an exco. They’ve announced the Ministers etc-all a bit odd. Hopefully the UDP will have a better record with civil servants than PPM. Mike Adam-fired by Chuckie; Tim Hubbell fired by Chuckie; Colford Scott fired by Action Man, Nyda Flatley fired by Alden. The test will be what will Mac do with his PS Gloria McField who was very much in Chuckie’s camp.? Or Rolston with Angela Martins…..I suspect the Governor will have to do a lot of moving people around/retiring. Ye Naw Movin o wa? "Ge Mi daa black broom in de cona dey." "I say Come out"
Mr Bush was underminded before by someone he trusted right under his nose. We do not need the Cut Throat Conspiracy this time. C H A N G E – T H E M or they will conspire against him again, and we will end up with another NET NEWS WATER GATE. They have announced the Ministers…that’s right. I fully endorse the picks. Now let’s getsomething straight…yes under the PPM watch those named were FIRED. Absolutely correct!!! Should Mac do the same to those mentioned? He is not that type of person. However, I’m sure that Gloria will feel a way due to her past and what she was allowed to do under the watch of her old Commander. Knowing Mac he will ensure that she still has a job. Rolie will do the same for Angela. After all there isn’t one dept. in Government left that she hasn’t been in. What time is it? UDP time…….. Those that FEAR should not. It is not Mac’s style of leadership!!! Mr Bush, do not let them put you on a guilt trip. Remember how you was deceived in 2004. They will do it again if they get the chance. Want their cake and eat it too. CHANGE THEM. Una shut and behave unaself, Una naw like MacKeva. He needs people who he can trust, to watch his back. Not people who will listen in on his phone calls and photo copy all his private mail. Let the dust settle down, and he will come out with a KABOOM as usual. This Island needs a leader like MacKeva, Mentally strong with a vision for the people of Cayman. Twyla, I thought you were hoping for Vincent Fredrick to get in? What happened there? Try "HUSH" it done. Everybody know I supported and voted for Theresa BIG TIME. Of course I gave support and went to the meetings of VINCENT, MARK JOHN GILBERT and JUSTIN. Does that tell you anything? ???? Allright, let me break it down in smaller pieces. "You can visit, chapel, baptist, and anglican but you are a Baptised Catholic. Get the drift. Still not telling ya where I put my other votes. I have always had confidence in Mr. Bush to do the right thing and know he will. I he feels that Ezzard is the right experienced Man for the Job, why not let him step up to the plate as Minister of Health which i’m sure he would do a better job than Mr. Eden has done. North Siders shouldn’t have to worry if he takes this post as i know Mr. Miller is smart enough to have someone work along with him, to seek out and deliver the needs of the North Side people. I would suggest he get 1 or 2 district liasion officers in place so people could have someone to come in and talk to and then that person/ s will then take matters to Mr. Miller for resolutions. (just my thoughts). I’m not a North Sider but i have seen her hard work and dedication to the North Side Community and know she would work well with Mr. Miller. What about Joey? First, Congrats UDP! You did it! Please make sure you disband all the PPM Boards in place as they have done nothing but cause problems all around. Please also do the country a favour now and ensure that Joey Ebanks does not return to the Turtle Farm or any other government office. He showed his true colours by continuously advancing himself money just below the limit that would require Board approval while checks issued to people by the Turtle Farm were being bounced at the banks. That is shameful and he should be punished! Thanks North Siders for being smart and keeping him out. The UDP from its first day has been open about the discussion of Ministries. Unlike with the PPM where everything was done in secret. I am only sorry Bodden Town didnt get a clean sweep, because I was getting tired to hearig My hands are tied. My hands are tied. Yo Mark and John, we tried to get Ms. Theresa in too with you all but didnt make it. Anyway all is well. We love you. Don’t worry he was always for UDP and he will be joining them no if’s and no but’s about that. Feel sorry for the North Siders when this happen. Dont worry, you loosers, north siders wont be let down like they were in the last 16 years, remember that the PPm promised us representation, but we never got it, they put Joey out there as a pawn to rectify their errors, so stop the b/s=====.the looser here is Joey, not as a candidate but as the pawn of the PPM. blame them, not Ezzard or the north side voters, get over it. Joey you need to dump the PPm and their nasty politicking, you can still be a good friend to the people of north side, like you say that you want to be. Rolston "Freedom Street" Anglin has made us proud and we support him all the way. My family and I once supported the PPM but could no longer do so after their disastrous four years in the house. The party seems so full of hate these days that I really don’t want to be associated with them any longer. Now the in fighting begins. Will it be Ellio, or Mike and will the lady for the Brac get what she was promised? Don’t forget Mac has his 3 boys in the West and Mark is going to want a seat. But not orget Mr. Miller he must be getting something for selling his sole??? Or is Mr. Rankin going to get what was promised for him runing to split votes?? I wait to see the results. I spoke with Ellio before the election and he made it clear to me that his focus was on making people’s lives better – and regardless of whether he was a Minister or otherwise he would do that to the best of his abilities – and I believe him. To the victor goes the spoils and congratulations – but how about the UDP making a gesture to unite the people and be seen to be doing what is best for the country – offer Arden the opportunity to resign from the PPM and continue in his ministry as an independent. He has been a fantastic minister for works – as the UDP have acknowledged. Why not permit him to continue to serve in that capacity even if it means that he not continue with the PPM. There is no need to stop that progress. To the poster "To the Victor Goes the Spoils", What, put Arden in as Minister? Yea right, and have him backstab the UDP feeding info to the PPM? No I don’t think so. Everything is still hush hush about the Matrix landfill debacle with no explanation as to why he gave the Canadians the contract without their company even having a trade and business licence instead of giving it to the locals. NO WAY. What about the CUC sweetheart deal? Do people remember that he was an employee of CUC and stood a chance of going back there to work if not re-elected? NO WAY TO THAT UNDERHANDEDNESS. NO WAY! We will all have to pay for him allowing CUC to milk us dry. He should have been voted out just for that. What about the roads that aren’t paid for yet? Please, let’s not even go there! "What about the CUC sweetheart deal? Do people remember that he was an employee of CUC and stood a chance of going back there to work if not re-elected? NO WAY TO THAT UNDERHANDEDNESS. NO WAY". The deal with CUC is no ‘sweetheart deal’ for CUC and there is absolutely no reason to believe there was any "underhandedness" (a potentially libellous allegation). In fact it is a substantial improvementon the UDP 2004 Heads of Agreement. The UDP leadership knows this very well but it was convenient campaign rhetoric to fool the masses who are feeling the pinch of a struggling economy and a scape goat was needed. Because of this here is my prediction. The UDP Govt. will tell the people that they really would have liked to re-negotiate the CUC agreement but the PPM had it wrapped so tight that they cannot do anything about it. "To the victor goes the spoils and congratulations – but how about the UDP making a gesture to unite the people and be seen to be doing what is best for the country – offer Arden the opportunity to resign from the PPM and continue in his ministry as an independent. He has been a fantastic minister for works – as the UDP have acknowledged. Why not permit him to continue to serve in that capacity even if it means that he not continue with the PPM. There is no need to stop that progress." I agree that Arden did well as minister of works and I think UDP should be the bigger party and admit that he should keep his post. Lets pick the better people for these posts! No need to have Arden be the minister for Works under the new UDP administration. We have capable persons who can fill this position, like Mark. "No need to have Arden be the minister for Works under the new UDP administration. We have capable persons who can fill this position, like Mark". Err… Mark would obviously have a fundamental conflict of interest. You remember…Gazette…. contracts…govt. UDP does understand those things, doesn’t it?